Microgreens are great for small spaces and novice gardeners. It’s April, and green is springing up all around you—except at home. Maybe you live in a townhouse with a yard the size of a flat-weave rug. Maybe you’re spending half your paycheck on half of a studio apartment. But don’t give up your dreams of green just yet. If you live in a microapartment, grow a microgarden—full of tasty, adorable microgreens. 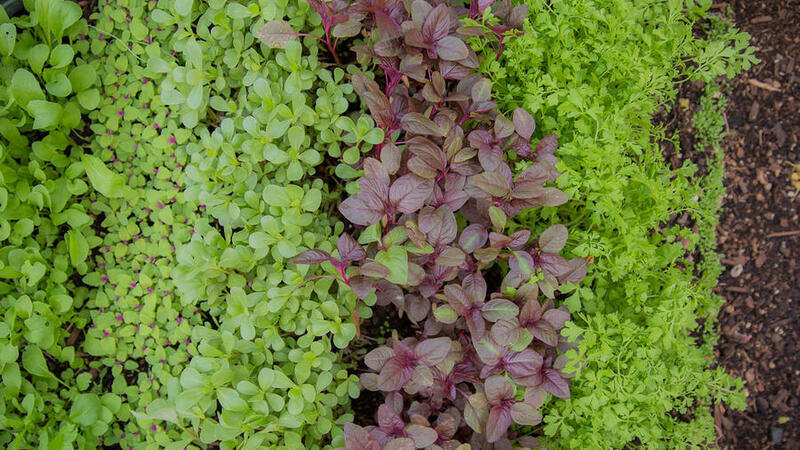 Microgreens, those petite plants chefs use to, are an easy but rewarding garden project. They grow as well indoors as out, and they don’t need much light or space. And if you’re a serial plant-killer, don’t worry: because they’ll be with you only a few short weeks, microgreens are pretty forgiving. A little planning, a little TLC, and you’ll be good to go. First, buy your seeds. There are hundreds of varieties to choose from, but include arugula, purslane, radish, amaranth, mustard and spreen. Pick your location: Microgreens love temperatures between 77 and 86 degrees Fahrenheit, so choose a warm spot—next to a large window if you can manage it. If you don’t have a bright window, make your plants a little tanning booth with some full-spectrum artificial lights. Now’s also a good time to start a logbook. As your garden grows, keep track of conditions such as light, temperature, and water to see learn your plants’ likes and dislikes. Your next crop will thank you. Pick your pot—a flat tray, an old plastic container, whatever, as long as it’s at least two inches or so deep—and fill it with potting soil. Sprinkle your seeds evenly across your garden-to-be, giving each variety its own section of the bed. Cover with a light dusting of soil. Keep the soil moist but not wet. If the leaves start to wilt, give your microgreens a drink; if the leaves turn yellow without going limp, water less often. Too little sunlight? Add artificial lights. Too much? Throw ’em some shade—a piece of burlap works great. Your microgreens will be ready anywhere from a couple weeks (arugula) to over a month (holy ) after planting. You can start harvesting them after they unfurl their first “true leaves”—the set after that generic seedling emoji that first pops out of the soil. Gently pick whole plants, including the roots, to give others some room to stretch. ChefSteps is a team of award-winning chefs, filmmakers, scientists, designers and engineers focused on revolutionizing the way people cook by inspiring creativity and encouraging expertise in the kitchen. Learn more at . Нашел в интернете интересный web-сайт про направление химчистка ковра. Этот интересный блог на тематику промышленный альпинизм киев.